Language - English but with a distinct accent and West Indian idioms. Time - As there is no Daylight Savings Time here, we are on Atlantic Standard Time in the winter and Eastern Standard Time in the summer. Dress Code - Casual everywhere but not beach attire. Must wear a shirt/wrap in town. You will be more comfortable in some of the fine dining restaurants a little more elegantly dressed but formal attire is not required. Taxes - Hotels, restaurants and other service industries charge a 9% Government tax. No sales taxes at stores and shops. Tipping - Most hotels and restaurants automatically add a 10% service charge. You may give additional tips if service warrants it. ATMs - All four banks in St. Kitts have ATMs in Basseterre. The National Bank has a number of others at various places around the island, but it is not a sure thing that your particular bank's debit card will work as expected. Your best bet is to go to one of the three banks on the Circus in town or the Scotiabank in Birdrock. The Marriott Casino ATM give US currency but only works with Visa, M/C and debit cards on Cirrus network. All other ATMs will give funds in EC dollars. Credit Cards - Most hotels, restaurants and businesses take the major credit cards although some will not accept American Express. Do not assume you can pay by credit card. Entry Requirements - All visitors will require a passport. It is also very important to have a return ticket to somewhere, most preferably your country of origin, regardless of the length of your stay. Water - Local water is very drinkable and bottled water is readily available everywhere. As all of the water is sourced from the rainfall, please keep conservation in mind. Electricity - Power is 220V but most all hotels have 110V plugs instead or as well. If you have a 220 to 110 adapter, it would not hurt to throw it in your bag, just in case. Telephones - It's no problem calling anywhere in the world directly, however, the costs are somewhat staggering compared to North American charges. Most 800 numbers in North America won't work, and even if they do, there will still be a charge on this end. Cell phones probably won't work but the cell service is being upgraded constantly and a phone that works here will work fine on many Caribbean islands, again, with roaming charges being substantial. There are numerous payphones all over the island and phone cards are readily available at many locations. Television - Most hotels have cable and you can have access to many of the premium channels like CNN, kids stations, movie stations, US network stations, etc. Driving - Rental vehicles are readily available (cars, vans, 4x4s, scooters). Driving is on the left hand side. You will be required to purchase a temporary license for $25US. Drive slowly and be aware of the ditches built across the road in the country as they can be devastating if you do not slow down first. Gasoline - Gas prices are about $3.89US a gallon but you will be hard pressed to burn a tank of gas even if you drive continuously all week as the island is so small. Stations are located in Birdrock, just out of town by the hospital and a little further out the same way towards Ross University there is a 24 hour station. There is also a station just past Brimstone Hill Fortress and one in Cayon. Taxis & Buses - Taxis are omnipresent in the Circus and at most of the hotels. The Taxis all have a yellow license plate with a 'T' or a 'TA' in the front of the number. The buses that run around the island all day are passenger vans and they have an 'H' on the green license plate. They have designated routes (pretty much the main road around the island) and the rates are fixed by the Government. Medical Facilities - The main hospital is in Basseterre, a couple of other smaller ones in the country and numerous health centers around the island. Recompression chambers are available by air ambulance in nearby Saba. There are at least three drug stores with full pharmaceutical services in town. How to get to St. Kitts - St. Kitts, Antigua or St. Martin are convenient entry points, from the USA usually via Puerto Rico. From Canada, direct flights to these islands both scheduled and charter. From the UK and Europe, also scheduled and charter flights to these islands. Immigration - A 6 month valid passport is required for all non-nationals. Most EC countries, as well as the USA do not require visas. A cash departure tax of US $20 or EC $53 is payable per person upon departure. • A Foreigner needs an Alien Land Holding License to own property on St. Kitts, except in Frigate Bay, which is exempt. This should take about a month for approval and B. Kassab Realty has application forms and can assist you with filling them out. • All beaches are public and have at least one established access. • Fully serviced lots cost from US$80,000 to US$250,000 depending on the size and location. • Construction costs vary. US$110 per square foot of roofed area depending on location, design and quality of finish. A 2,000 square foot house takes about 10 months to build. • There is a good Government water supply below the 800' contour. Water costs EC $10 (US $3.70) per 1,000 gallons. • Electrical charges for an average family in a 3 bedroom house heating water with electricity is roughly EC $350 (US $130) per month. • Cable TV (42 channels) costs EC $87 (US $32) per month. • Grounds maintenance for 0.5 acre costs approximately EC $320 (US $120) per month. • A 3 bedroom house with pool (not on the beach) rents short-term for US $2500 to US $3000 per week in high season, US $1200 - US $1500 per week in low season. Rental commissions vary from 15% to as high as 25%. Long-term rental (3 months plus) from US $1000 to US $1600 per month and normally attract a 10% commission. • Maid services costs EC $15 (US $4.05) per hour. • Property insurance (fire, hurricane, earthquake) costs 1% of the sum insured. • There is no personal Income Tax or Inheritance Tax. House Tax ranges from US $800 to US $2,000 per annum. • The EC dollar is tied to the US dollar at a fixed rate of EC $2.70 to US $1.00. You can also have foreign currency accounts at most of the banks. 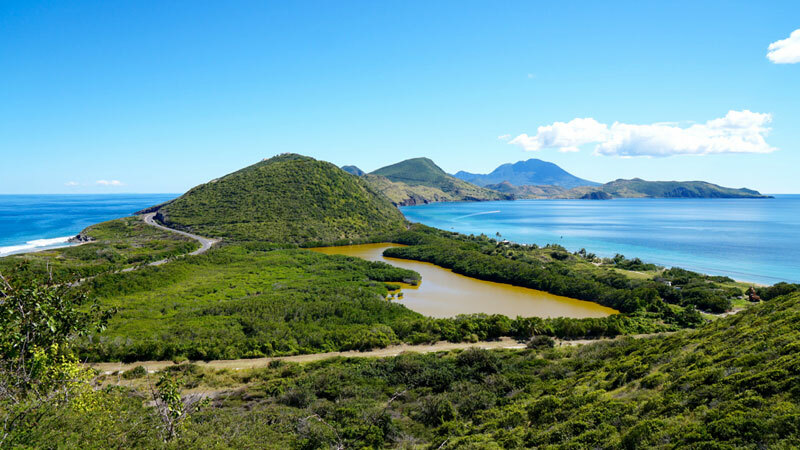 • St. Kitts & Nevis have an excellent reputation as an offshore financial center with up-to-date legislation covering the formation of IBC's and asset protection trusts. • An Economic Citizenship Program exists providing the possibility to qualify for citizenship through investing over US $350,000 in pre-approved real estate projects.